Freedom Alert is an emergency communication device that gives the user instant two-way communication at a single push of a button. 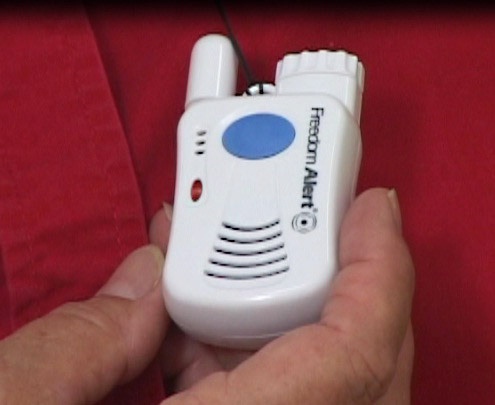 Freedom Alert fits in the palm of your hand, and is designed for use around the household in a 600 ft radius. The device can be worn on a lanyard, belt clip, or wheelchair/wrist strap. For persons with medical conditions or elderly relatives living alone, this is a liberating product that provides instant freedom. Up to 4 contact phone numbers can be programmed into your Freedom Alert unit. Choose family members, neighbors, nurses, or friends for example. The red button in the center of the Freedom Alert pendant starts the emergency sequence, in which a set of contacts are called consecutively until someone answers. In the event that none of your emergency contacts answer the phone, Freedom Alert connects you to 911-emergency via the 2-way speakerphone. Help is on the way at the single push of a button! Freedom Alert is water resistant and includes a base station with battery charger. Installation and configuration is simple, requiring only a phone jack and outlet plug.